2. Creates an atmosphere of trust in which issues can be objectively and fully resolved without retaliation or the fear of reprisal. Specific, detailed guidance on the CAP IG program may be found in CAPR 123-1 (General Information), CAPR 123-2 (Complaints), and CAPR 20-3 (Unit Inspections). The Inspector General is also required to publish a Plan of Action (IGPoA). This document can be reviewed by clicking on this link. 1. 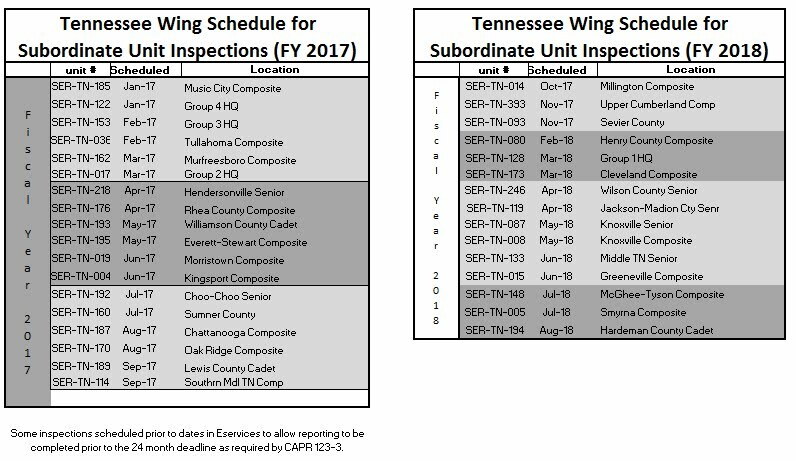 IAW CAPR 123-3, the Tennessee Wing Inspector General (TNWG/IG), Maj Ron Broach, has developed the attached schedule for Subordinate Unit Inspections (SUI’s) for the Fiscal Years of 2017 and 2018. 2. IAW CAPR 123-3, the Tennessee Wing Commander (TNWG/CC), Col Arlinda Bailey, has reviewed and approved this schedule. 3. This schedule will be added to the Tennessee Wing Calendar located at http://tncap.us and an SUI specific calendar is located at http://ig.tncap.us . These calendars are available for member review at any time and will be the most current record of scheduled plans. 4. Unit command staff will be added to the calendar events using the @TNCAP.US email addresses for organization positions (i.e. TNxxxCommander@TNCAP.US OR TNxxxDeputyCommander@TNCAP.US ). This will allow receipt of notifications as events are updated.